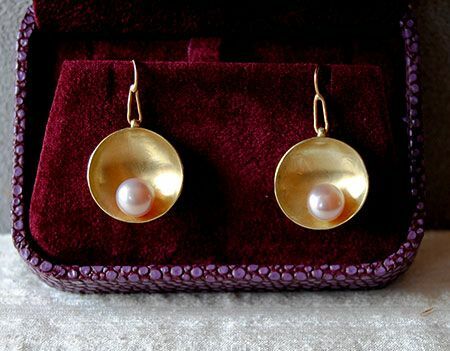 The concave 18K Green Gold dish elegantly enhances the subtle rose tone hues of the lustrous pearls. Pearls and gold together speaks of sophistication and elegance coming from simple and elemental forms--the sphere and the hemisphere. Original and handmade by me personally, from scratch. Hallmarked "Ricco" and quality marked "18K"
Comes in quality presentation box with Certificate of Authenticity.